Heat oven to 350 degrees F. Spray 9 x 13-inch baking dish with cooking spray. Add rice, chicken broth, and champagne to the prepared baking dish. Stir to combine. Bake uncovered for 45 minutes, stirring once about halfway through, until most of the liquid is absorbed and the rice is tender. Stir in the Parmesan cheese, butter, salt, and pepper. 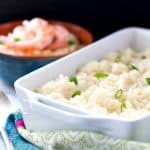 If the risotto seems too thick, slowly stir in addition chicken broth (1-2 tablespoons at a time) until it reaches a smooth and creamy consistency. Garnish with green onion or fresh herbs and serve immediately.